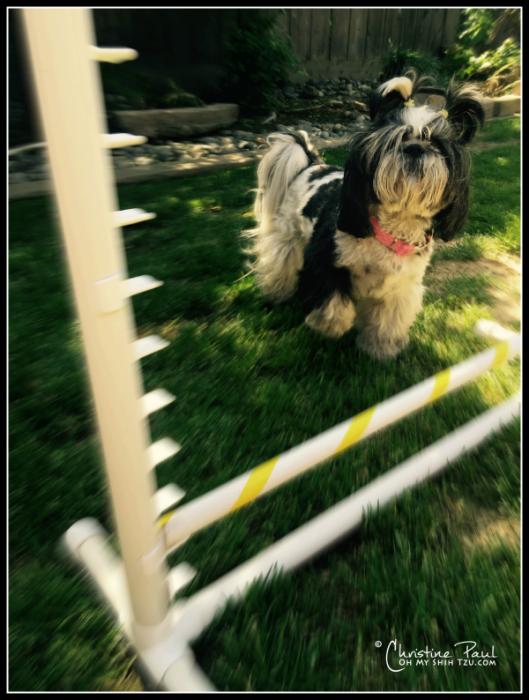 So if you think you might want to try some agility with your dog, but also want to do it safely (no broomstick on a chair), then building your own equipment out of pvc may be right up your alley. Today I am going to show you how I made my jumps, and also give you links for additional equipment plans. 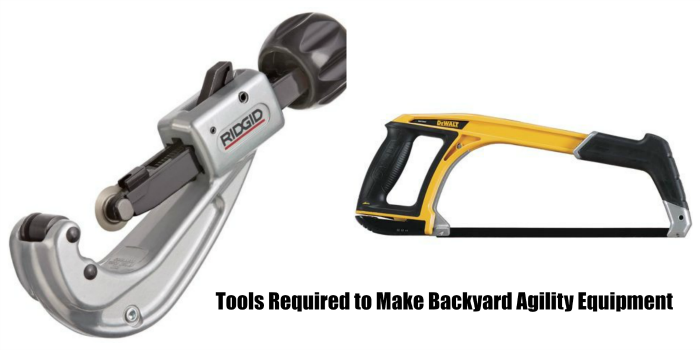 PVC cutter (Tube Cutter) – spend a little bit more for a tube cutter like the one below, the lower priced ratchet cutters are a lot harder to use. There are several ways you can make jumps, but I like using a base bar method. I use the above lengths due to the size of the Shih Tzu’s. I find that it saves a little money by only having to buy only 2 pieces of PVC. 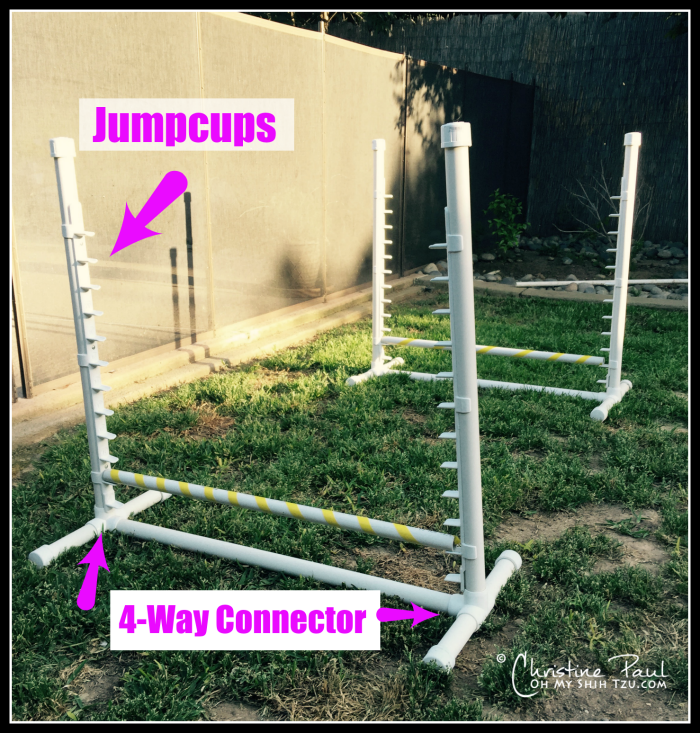 But if you have a medium to large dog here are a set of jump plans from Clean Run that help you build a little bit taller and wider jump. As you can see from the picture, the bars appear to be a little smaller (diameter) than the uprights. At the time when I made these jumps I made more than one, so I used 3/4″ PVC for the cross bars (2- 3/4inch 8ft pvc and 3 – 1 inch 8ft pvc). I hope this helps and inspires you to make your own jump(s). Always start out with 1 jump, then make 3, and finally work your way up to 5 jumps for your backyard drills. And if you want more equipment plans? Don’t worry, we will have a few more posts with detailed instructions on making, a teeter, pause table and dog walk! 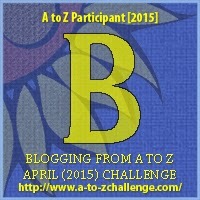 Thanks for joining me today in the 2015 A to Z Challenge! Don’t forget to stop by tomorrow! Made some one summer – no one was even interested 🙁 It looked impressive though…. I love this idea! Making my own would have ordinarily intimidated me, but this looks like something I can do – thanks for sharing and the detailed instructions and photos! I got lazy and just bought my back yard jumps from Amazon. It would have been way cheaper to make them though. It looks super easy. Very awesome! I’ll have to keep this in mind for ours! I’ve been wanting to do agility with a few of them! Great way to save money while practicing agility! Susan and the gang from Life with Dogs and Cats recently posted…Text from Dog: Mud. Bath. Cathy Armato recently posted…Dogs’ Love Spring! Fantastic! I homemade my agility equipment before we started actual classes. Now we have jumps, tunnels and contacts at home to work on. Practice makes perfect! Great ideas! May have to give this a try. Robin recently posted…Why Do Cats Hate Water? We need some of this stuff. Do have a tunnel for now. Jana Rade recently posted…The Pet PT Pit Stop: What’s in a Dog’s Gait? Brilliant idea for DIY agility equipment. Very helpful for my 3 pups buddies. Great project! I’m looking forward to seeing the other plans too. We have some of those! Unfortunately, Leo forgets what his back legs are supposed to do, so he knocks them over a lot. Backyard agility equipment sure is handy. Bookmarking this for when we have a backyard. We will definitely be building some backyard equipment! I am literally squealing with delight a I write this! Yes, I DO want to make backyard agility equipment!! What a cool DIY project! It’s a shame that when I see those agility jump bars that I just run around them. BOL Ma could never convince me to jump over them. Very cool! We are getting our dad on this as soon as the snow melts!! Thanks for sharing!